Rosalie with her husband Joe. 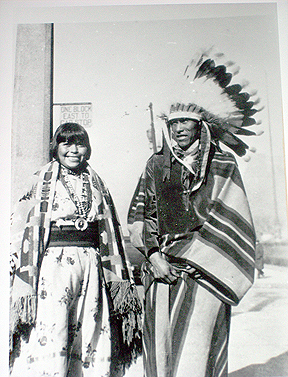 Rosalie Simbola Aguilar was from the pueblo of Picurus, while Joe was from the pueblo of San Ildefonso. Joe was the son of Susana Martinez Aguilar (c. 1876-1949) and Ignacio Aguilar (c. 1872-1945). Rosalie married Joe on February 27, 1922. They lived at the pueblo of San Ildefonso. 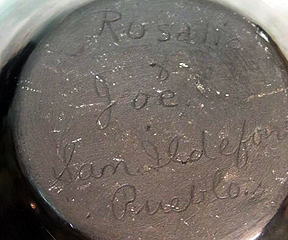 Joe was an excellent painter and painted pots formed by his mother Susana and his wife Rosalie. 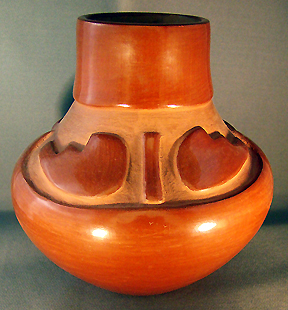 He could form pots as well as carve designs. 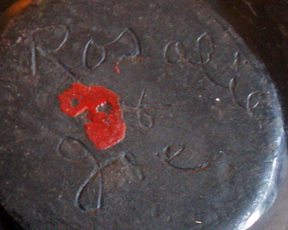 Rosalie was a prolific potter during her lifetime. 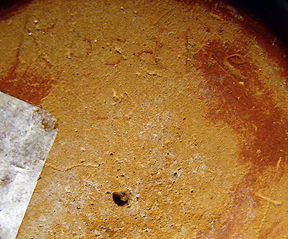 She was a friend and neighbor of Rose Gonzales and during the early 1930s she and Rose were among the first to carve pottery. 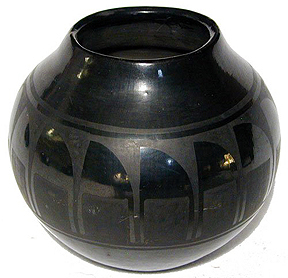 Rosalie's deep carved blackware in the form of jars and bowls were carved in the 'cameo style.' 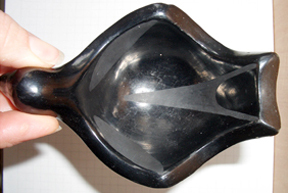 The clay was carefully carved away allowing her designs to stand out in relief. She then rounded the edges by sanding. Rosalie and Joe had eleven children. Three of their children, Alfred Aguilar (B. 1933), Florence Aguilar Naranjo (B. 1921), and Jose Victor Aguilar (B. 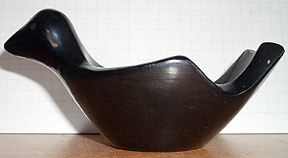 1945), have won awards for their pottery. Today Rosalie and Joe's children and grandchildren continue the Aguilar family tradition of making and painting fine pottery.